Recent police raids against the Camorra mafia group across Europe reveal alleged plots to traffic marijuana, cocaine and guns. But the suspects were surprising: two ex-diplomats for the United Nations. At around 4:30pm on 11 February 2017, a dark gray Audi A6 exits the motorway heading to north Naples. The driver, a chubby 52-year-old man from Castellammare di Stabia, the coastal district south of the city, is nearing the end of his 1,800 km journey from the Netherlands to south Italy, the latest in a series trips he has taken in the last few months. This will be his last for a while. Police from the Guardia di Finanza, lying in wait just beyond the toll booth, ‘randomly’ pull the car over. Even with the windows closed, the stench of cannabis from the car is so overwhelming that they do not need sniffer dogs. In the boot, packed inside several large holdalls, they find 50 kg of hashish and ‘amnesia’ marijuana, a strain with intense psychotropic effects. Panicked, the man pulls an ID card from his pocket and hands it to the cops. This shows ‘diplomatic immunity’ that he believes prevents his arrest. On the document is a picture and a name: Sebastiano Lauritano. It states that Lauritano works as a “coordinator” for His Eminence Angelo Antonio Toriello, another Italian national who is curiously deputy ambassador to the UN for São Tomé and Príncipe, a two-island west African state and a former Portuguese slave colony, with a population of around 200,000. Alas – his ‘Get Out of Jail Free’ card fails. The police arrest and charge him with drug trafficking. In comments to an Italian newspaper at the time, Ambassador Toriello publicly denies that Lauritano was ever working for him, saying "I have never accredited [Lauritano] with any positions or functions at my diplomatic office." In fewer than five months, Toriello will join his coordinator in jail. Toriello and Lauritano today face charges of drug trafficking for Naples-based mafia the Camorra, whose influence and narcotics operation stretches from Europe to Morocco, Ecuador and, apparently, São Tomé and Príncipe. The indictment, obtained by The Black Sea and the Investigative Reporting Project Italy (IRPI.eu), cites additional evidence suggesting that the diplomat and his accomplice attempted to exploit Toriello’s ambassadorial position to traffic cocaine from Ecuador to Europe in diplomatic suitcases. 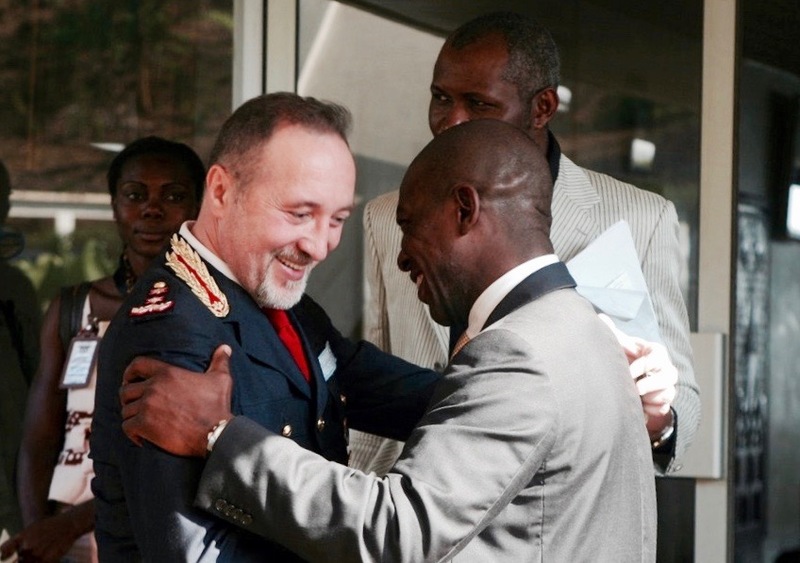 They also discussed selling the Camorra weapons belonging to São Toméan government. Wiretapped conversations between this pair imply that Lauritano - through his mafia-connections - orchestrated Toriello’s appointment as São Tomé and Príncipe’s United Nations representative, and paid his own boss 5,000 Euro per month. Lauritano’s arrest was not serendipitous. For several months, the police had him - and a cadre of alleged conspirators - under surveillance, tapping his phones and installing listening devices in his car. They were gathering evidence as part of 'Operation Santa Lucia', a transnational investigation started in late 2015 by Spanish and Italian police designed to disrupt into the Camorra’s European drug smuggling and money laundering activities. On 5 July, police launched a series of raids in Italy, Spain and Germany, arrested over thirty people and seized cocaine and marijuana. They confiscated at least €5 million in business assets, among them two posh restaurants and an car import-export service in Barcelona; a luxury jewellery shop and a football agency in London; a car dealership in Portugal; and two dealerships in southern Germany. Lauritano had fallen under the dragnet six months earlier over contacts with influential members of the Polverino, Puccinelli and Contini, three powerful clans of the Camorra from Naples. From Lauritano, they got to Toriello - and learned that these two men are not ordinary drug trafficking suspects. 20 March 2016. Ambassador Toriello is a cheerleader for the United Nations ‘Day of Happiness’, a 12-hour marathon of fun at the New York headquarters of the UN, run through his initiative ‘Humanicy’ which aims to bring ‘a human side’ to diplomacy. Representatives of world leaders bounce and hug inflatable globes, listen to sacred chants from a Buddhist monk, and ancient Chinese instruments play a version of Pharrell Williams’ anthem to joy ‘Happy’. 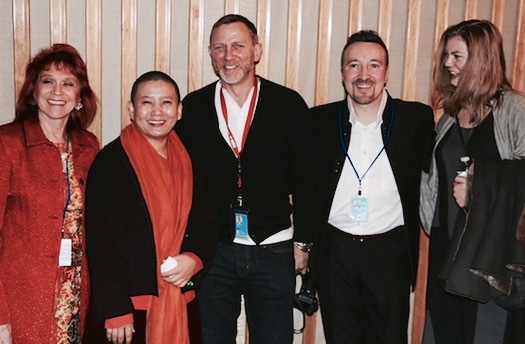 Even James Bond 007 himself, Daniel Craig, turns up. 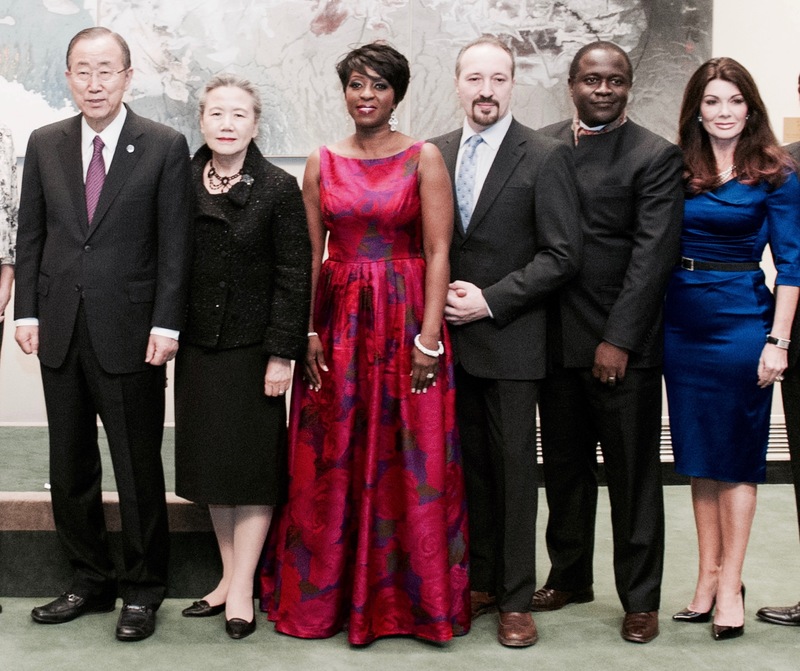 Toriello invited the multi-millionaire actor to join hands with the UN delegates in a “show of solidarity and caring”. It is greeted with much applause. But the assembled dignitaries were not aware of Toriello’s past, his dodgy connections, bizarre pseudo-scientific experiments and fake qualifications. Toriello was born in France to Italian parents in October 1962. The family later moved to Mercato San Severino, a small town in the south between Salerno and Naples. He spent much of his youth following a religious calling with the Franciscan Order. While there he says he was sexually abused by priests. Later he was was forced out of the monastery when he opened a hotline for victims. 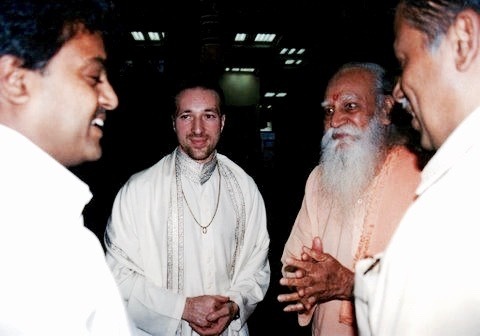 Since then, he flittered from one venture to another, racking up a history as bar owner, ‘investigative journalist’, showman, founder of holistic religious groups, scientist and a researcher devoted to helping grieving parents speak to their departed children. For a while he still enjoyed his persona as the ‘singing’ Franciscan Friar, Emanuel Toriello, bringing his religious message to the forgotten corners of the earth, while crooning classics, such as ‘Are You Lonesome Tonight?’ and ‘My Way’. Despite his glaring lack of expertise, in May 2012, Toriello was appointed as São Tomé and Príncipe’s representative for the west African republic's first diplomatic mission to the United Nations in New York. The country’s then 74 year-old President Manuel Pinto De Costa signed a secret decree three months earlier, bypassing the nomination hearings in the parliament that might have provided answers as to how a white, Italian-French national with no prior diplomatic or political experience, and no Portuguese, could end up in such a high office. He appeared to enjoy the spotlight the role offered. He became fond of calling himself a doctor, and claiming to have a ‘scientific background’. His website, paradoxxmedia.net, cites a PhD in Philosophy of Criminology and a Master of Laws (LLM). But this ‘master's degree’ is fictional, bought from the Dublin Metropolitan University (DMU) - a ‘diploma mill’ run by a convicted embezzler, which was closed down a few years after Toriello’s graduation for selling worthless degrees, mostly to foreigners. Similarly, the University of Hartford in the U.S., where Toriello claims to have earned his doctorate in early 1980s, denies ever running a “distance learning” Philosophy of Criminology PhD - nor is there a public record of Toriello graduating there. He also began hiring Italian friends in key roles - such as Sebastiano Lauritano. On 30 February 2015, Toriello launched his biggest project in the UN - the ‘Stop Ebola and Build for the Future’ concert to maintain global awareness of the Ebola Virus, which had killed 10,000s in west Africa. The concert was hosted at the UN General Assembly, and was preceded with a speech by Secretary General Ban Ki-Moon thanking the mission of São Tomé and Príncipe and urging citizens to pledge financial support to defeat Ebola. At a press conference before the event, Toriello’s announced his own $2.5 billion dollar aid project to fund hospitals, health facilities, equipment, housing, infrastructure and start-up activities for locals in West African countries hit hard by the epidemic. Halfway through, Toriello introduced Lauritano as a doctor and invited him to explain the science behind the virus. Lauritano holds no medical qualifications. His degree in homeopathy is not formally recognised, having been granted by the since-closed Clayton College of Natural Health in Alabama, a non-accredited, distance-learning college specialising in ‘alternative medicine’. The Ebola project was to be financed by the World Bank and UN, according to Toriello, and the billion-dollar contract would be awarded to the Nevada-based The Pintus Group. Subsequent investigation by the authors reveals that the man behind this company was another Italian, Curio Pintus, a convicted money launderer who had shifted half a billion dollars of narco-cash belonging to the Calabria-based mafia group, ‘ndrangheta. After spending three years in prison in Italy, Pintus had moved his operations to the U.S. The investigation also exposed how Lauritano and Toriello conspired to hand the lucrative contract to Pintus without any public tender - a move that later forced the UN to kill the initiative. While researching the story, we met with Toriello at a restaurant in London during the Christmas holidays of 2015. This was a location supposedly “pre-approved” by his security team, the Italian claimed. Dressed in a light grey suit and with a fading silver hairline, the ambassador peppered the conversation with grandiose statements about his life and career, often with an insincere humility. For most of the two hours, he was reluctant to divulge any information about the deal or release a copy of the contract with Pintus. But he was willing to hand it over for money. This was necessary, he said, because revealing the truth would result in his dismissal. And, Toriello added, he had “a family to think of”. The Ebola affair appeared to have no affect on Toriello’s standing with the São Toméan government - and both he and his assistant continued in their diplomatic roles. But in late August last year, Manuel Pinto da Costa lost the São Tomé and Príncipe election and soon left office. As is the usual custom, his diplomats and cabinet ministers departed with him. Around this time the Italian police probe began investigating their connections to the Mob and their potential involvement in criminal activities - such as trying to use a diplomatic cover to smuggle cocaine. Transcripts of police wiretaps of conversations between Lauritano and Toriello paint a picture of the duo as smugglers who were well-connected, but incompetent. One of the conversations allegedly took place in November, months after Toriello is supposed to have been fired. The topic is cocaine. Specifically, the transport of up to 120 kilos from Ecuador to Europe in league with the Camorra. According to the indictment, on 17 November, Lauritano travels to Ecuador for a five-day trip set-up the deal, staying first in the country’s capital, Quito, and then the small, southern town of Santa Rosa. At this stage, Toriello stays away. The plan, worked out between Toriello and the Camorra brokers, is to hide between 70 and 120 kilos of coke in ‘diplomatic suitcases’. This is luggage designed and adapted with sheets of lead to hide the illicit contents. Toriello will waltz the baggage through customs and bypass the security gates, flashing his ‘diplomatic immunity’ as proof he is untouchable. But the deal soon begins to crumble. The Camorra buyers no longer want to commit to such a heavy amount. Instead, they ask for 30 kilos - and agree to pay 500,000 Euro. The Colombians aren’t happy, but agree. The cocaine will be delivered by the 27 November, they say. On Monday 21st, Lauritano flies home to Italy and waits. He complains to 44-year old, Cristian Neri, drug broker for the Camorra and one of the architects of the plan, that they “must give me [the] 500,000 Euro” fee originally agreed, regardless of the shipment size. For over a week the cocaine sits in an apartment in Quito, waiting for Toriello to come to Ecuador and collect it. Now, the Camorra are not happy - and Neri begins to threaten Lauritano. Ten days later on 7 December, Lauritano and Toriello discuss the deal. Instead of half a million, the pair agree to 240,000 Euro, if Toriello can fly to Ecuador before Christmas and fly out the coke back in a smaller “diplomatic briefcase”. But it is not so simple, Toriello complains. His travel is determined by the São Toméan UN mission, and so can’t be scheduled at the time he wants. In the end, Toriello never makes the trip and the deal falls apart, leaving Lauritano owing 50,000 Euro to the Camorra. If Toriello ever planned to make the trip, the affair raises questions about how he could smuggle cocaine using his ‘diplomatic cover’ months after he supposedly left his job. 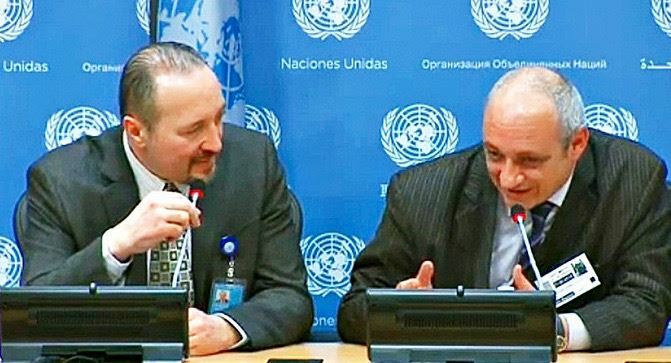 Alcínio Cravid e Silva, the new chief of staff for the São Toméan Foreign Ministry, and main contact for UN diplomatic services, told The Black Sea that he believes Toriello was fired and lost his official credentials when the new President came into power in August last year. While the Italian police believe he retained some ambassadorial benefits, they could not provide evidence. Neither e Silva nor the country’s new Foreign Minister, Urbino Botelho, gave an official date of Toriello’s departure, nor could they answer how he and Lauritano remained able to advertise their diplomatic status to the Camorra for international drug deals. While the cocaine deal was falling apart in December, Toriello hears the Camorra are after weaponry. He has another money-making idea. According to wiretaps, Toriello pushed Lauritano to offer two men from the Camorra, named the ‘Two Gennys’, ‘big quantities’ of weapons he has for sale: specifically, up to 15 kits made up of 7mm Penna handguns, ammunition, and vests. The cost: 70,000 Euro per kit. “You have to tell [the contact] that the delivery times have to be flexible,” Toriello says on tape. “The delivery time could be one week or 45 days,” he adds, before explaining that the “merchandise” would be bought and “sent to the Government” first, and then to Toriello. But the guns will be clean, says Toriello, because they will come from the government of São Tomé. São Toméan officials would not respond to questions about how one of its ex-diplomats allegedly offered to sell their weapons to a violent mafia group. Though the two Italian would-be-players’ illicit deals failed, they had a third crack at the big time: a consignment of nearly a tonne of marijuana and hashish from Morocco. The buyer in the deal is again the Camorra in Naples, and the middleman is again Cristan Neri. Early on in the discussions, according to the wiretaps, the gang’s drug contact in Morocco says they can go as high as 30 tonnes per deal. This time, however, they are only prepared to sell 900 kilo - as a test. Apparently, the partner didn’t agree with splitting the fee. Instead, over the next months, Lauritano acts as a mule for the two Gennys, who run a monopoly on the sale of ‘amnésia’ marijuana in Naples. He transports their potent puff from a loft in Amsterdam back to Naples by car - and sometimes Toriello joins him for the ride. But Toriello appears less than committed to the trafficking cause. During a trip from the Netherlands to bring the stash he complains about his financial difficulties and family problems. He tells Lauritano he must go back and deliver 2,000 Euro to his wife and two children, who live in London. The wiretap evidence collected in these months also sheds light on how Toriello, an Italian lacking any political experience, and with fake degrees and legal troubles, could have been installed as senior diplomat for a country he had never even visited. It suggests that Lauritano was a key player in this charade, paying Toriello a monthly fee of 5,000 Euro, and, in return, the former Franciscan Friar hired Lauritano as his coordinator. Speaking with Cristian Neri, the drug broker, on 16 December 2016, Toriello said that he is in ‘a project’ with Lauritano, that the two of them play ‘roles’ and implies that Lauritano is in charge. “Do you know why I have a diplomatic rank?” he says. “I tell you the truth. [Lauritano] had to hold it, but he let me hold it." During one of these routine drug runs from the Netherlands, Lauritano is grabbed by the police and arrested. He has been in jail since. Toriello’s activities over the next few months are unknown. Police say that he continues traveling on his "diplomatic mission" for São Tomé and Príncipe, but there is no evidence of this. The shameless self-promoter remains quiet, and it is believed he is staying with his family in London. At the beginning of July, Toriello takes a flight from the UK to Italy to visit his parents in Mercato San Severino. The move surprised the police - who assumed that with Lauritano in jail and talking to the cops, Toriello would not enter Italy and risk his freedom. When the ‘Operation Santa Lucia’ raids are carried out across Europe on 5 July, Toriello is among those arrested, grabbed at his parents’ home. Among his possessions, they find his identification card for the UN headquarters in New York - a symbol of Toriello’s four years at the senior table in the hub of global diplomacy. One big question remains unanswered: was he invited by the President, the mob, or both?